Ray Stantz was responsible for the selection of the Stay-Puft Marshmallow Man as Gozer's incarnation on this plane of existence. His fond childhood memories of the mascot led him to believe it could never possibly harm them. 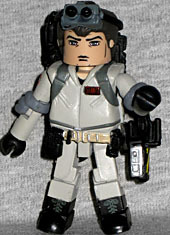 While Ray is wearing a standard Ghostbusters uniform, it doesn't mean he's identical to the rest of the team. He wears his belt lower on his stomach, and has different gear hanging on his belt - including, impressively, a closed ghost trap with the foot trigger coiled up. It's a removable piece, too! All black and silver, with yellow hazard stripes across the top. He has the standard proton pack with a snap-on energy stream and the elbow pads, but he gets a unique set of Ecto Goggles designed to fit over his hair and sit on his forehead. Even after causing millions in property damage, the Stay-Puft Marshmallow Man seemingly recovered from his possession by Gozer and even went on to become an ally to the Ghostbusters team. As Peter Venkman put it, he is "all better now." If you run a sea sponge through a blender and then leave it alone, it will eventually re-form itself. So maybe that explains how Mr. Stay-Puft, who blew up in the first movie, could come back to life for the cartoon (which is what that bio is refering to): the boys cleaned up the mess, dumped it all in the containment unit, and it eventually shlorped back together. 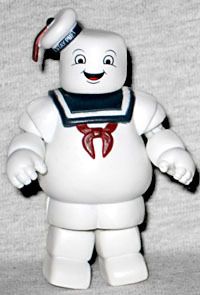 Stay-Puft has a normal Minimate body beneath all those add-on pieces, but it's not like you can see any of it. He's plain white, rather than having painted shadows, and the blue and red used for his "clothes" are dark. Out of the six Stay-Pufts Art Asylum has made, this is the only one that's actually smiling. The first Gb Minimates set we reviewed was Ray and Stay-Puft, and it's cute that these two characters keep getting paired together.